A proposed extension to the Brexit transition period should only be considered if the EU drops its demand for a backstop, Dominic Raab has said. The Brexit Secretary said an option floated by Theresa May that the UK could remained tied to Brussels beyond December 2020 would only be an “alternative” to the Northern Ireland backstop arrangement. Mrs May told leaders of the remaining EU member states in Brussels that she was ready to consider an extension by “a matter of months” of the transition period. The idea has angered Brexiteer MPs, including Mrs May’s partners in government the DUP, with the party’s deputy leader Nigel Dodds stressing it offers “nothing significant” on the backstop proposals. Writing in the Sunday Telegraph, Mr Raab said that while the UK is “committed” to agreeing a backstop for NI in the event of a no-deal Brexit, he warned that the Government “will not countenance” any customs or regulatory border down the Irish Sea. The DUP has also repeatedly emphasised that such a move is a red line for the party, and has threatened to withdraw its support for the prime minister if she caves in to the EU’s demands. In a bid to break the deadlock over the backstop issue, Downing Street has suggested that the UK as a whole could remain in a country-wide customs arrangement with the EU for a short time. But Mr Raab said there could be no “indefinite limbo” inside the EU’s customs union. He added: “The prime minister has rightly refused to rule out considering different approaches - including extending the implementation period for a limited period of a few months, as an alternative to the backstop. The Brexit Secretary’s intervention comes as former Brexit minister Steve Baker is trying to block the EU’s backstop plan for Northern Ireland. 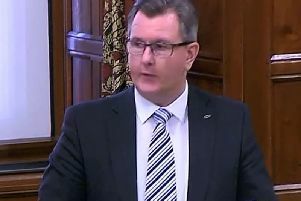 The Tory MP has tabled amendments to the Northern Ireland bill, seeking to make it a legal requirement to get the Stormont Assembly’s approval for any plan to treat Northern Ireland differently from the rest of the UK. The devolved government at Stormont has not sat since power-sharing collapsed in January 2017.